The original kitchen was a mess: inaccessible and unuseable countertop areas, no dining area, very little prep space, dark and without nearly enough storage. The new kitchen triples the usable countertop area, doubles storage, brightens the room up substantially and makes it seem far larger - without moving any walls. We needed a modern cook's kitchen without having it clash with the rest of the house, and I think we succeeded. 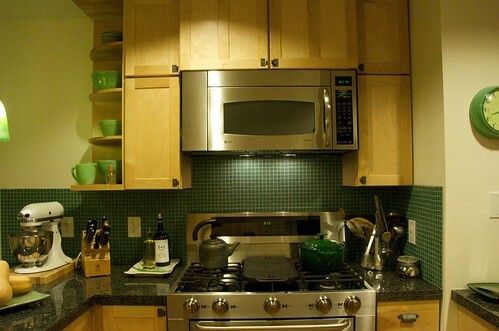 The green hanging glass light fixture comes from Bruck Lighting; the beautiful green glass mosaic tile from Hakatai up in Ashland, Oregon; the enormous, apron-front stainless sink - big enough to bathe a small child in - from Lavello Sinks. The cabinet hardware is from House of Antique Hardware (the cabinet pulls are actually winow sash lifts, mounted sideways), and the faucet is from Delta. The cabinets are an inexpensive model from KraftMaid and the stone is from a local fabricator and installer. The floors are a solid-plank bamboo, and the color matches the original oak hardwood in the rest of the house. The green motif matches Jineui's large collection of Jadeite plates, cups and bowls, some of which might be visible in certain photos.